One of my new readers went out of his way to expose a very strange example of racism and bigotry operating under the guise of humanitarianism… by a University Lecturer. I’ve been reading through a number of statements made by this person, his full name (apparently) is Refaat Alareer, a lecturer in English and Creative Writing at the Islamic University of Gaza. Refaat Alareer presents himself as a resident of Gaza, a humanitarian supporter for Palestinian rights and the Palestinian right for self-determination, all respectable and just causes. His dehumanisation of non-Palestinians, particularily in the context of Israel, is a terrifying example of extremism. The plight of the Palestinian people is a complex subject and people with this kind of worldview marginalise rather than empower them. Reading through the links and images sent to me and reading further into this man’s account I saw a constant stream of black-and-white opinions, dehumanisation of non-Muslims, promotion of genocide, justification of murder and torture and use of hyperbole to promote his own mindset. 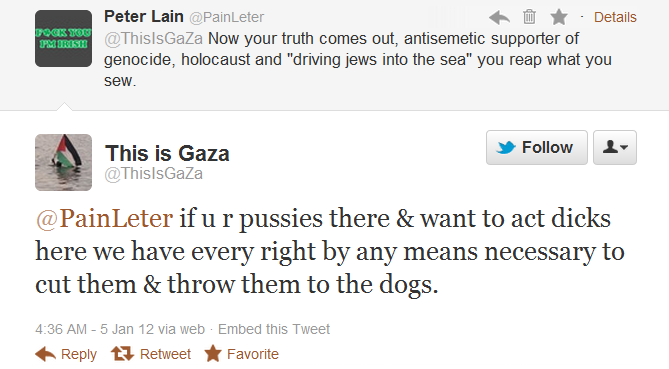 With this kind of attitude how can there ever be peace between Israelis and Palestinians? How can a path to peace be tought when teachers preach this kind of mentality? Simon Parker, headmaster of Coppice primary school in Essex is such an overblown, almost comical racist that I don’t even feel shocked reading through his comments. What made him this way? This ridiculous caricature of a teacher in modern England? Why was his sense of racial hatred stronger than his desire to teach, to be a leader, to even keep his career? This was pure bigotry, irrational and at the expense of himself and the families he hurt. Here’s a story from HOPE not hate, a fantastic organisation that promotes interracial cooperation and normalising the beautiful multiculturalism of the UK. They also are associated with ICARE, the International Centre of Anti-Racism in Europe. The irrationality of this kind of hatred is something I’ve already touched upon before, I’ve read interesting articles regarding extreme racism (rather than “run of the mill bigotry”) as a possible manifestation of mental illness. Regardless of categorisation there are clearly a lot of symptoms in common between Extreme racism and Psychosis. This is one of the more painful examples of hatred I’ve seen, mainly because it represents a paradigm shift regarding race/religious hatred and its acceptability in modern culture. One of the aspects of the statements she made which are most worrying to me is her repeated addition of “Zionist” as a forethought. The same thing happened across the USA and in the UK when referring to Islam, “fundamentalist” Islam, post 9/11. It’s a modern qualifier, a way of justifying racism and bigotry, it’s a screen to try and add some form of legitimacy to a person’s hatred. I find it abhorrent that this woman, this African American woman, this educated woman, this educator, could spout this kind of hatred. It’s not legitimate, making broad generalisations based on someone’s ancestry is erroneous, it’s horrific and perpetuates some of the worst human rights tragedies in our world. As terrible as bigotry can be when spread by people in a position of power in the education system, there is still nothing as terrible as hatred passed on by parents or one’s society. I’ve seen this many times before in my own life, ultra-nationalism is alive and thriving in the UK and manifests itself in many ways, other forms of overt ethno/religious hatred are also rampant including this story from East London. The idea that we as educators should ignore this kind of systematic indoctrination is appalling, if anything we should take the responsibility of discouraging these kinds of dysfunctional beliefs. Sadly there has been pressure for educators to “not get involved” in cultivating values in children, sadly this is ignored mainly in the few but worrying cases where bigoted mindsets are marketed to children. In many cases our hands are tied, we can at least take responsibility for passing good and functional values to our own children. Why not start with the classics? One of the stories that have stuck with me for the longest time is that of Elizabeth Davies, for a number of reasons. The most prominent reason in my mind wasn’t the fact that her bigotry and racism was so lacking in guile that it seemed almost puerile. It wasn’t the obvious ignorance of her actions. It was that fact that she not only spouted racism but abused her primary school children. I remember reading the article in the Grauniad early last year and one of the things that concerns me more than others is that she will be allowed to teach again in a year. Although the likelihood that a reputable school would be willing to employ a woman who would spray Bangladeshi children with air-freshener is minimal I must admit I’ve seen stranger things. One of the points I intend to make in my blog is the almost universal examples of people in positions of power, mainly thought leaders in the academic community, teachers, lecturers and the ilk seem to take on extreme views founded in assumptions of righteousness and moral absolutism which pollute our growing members of society, especially the vulnerable. More to come as I keep researching and updating.